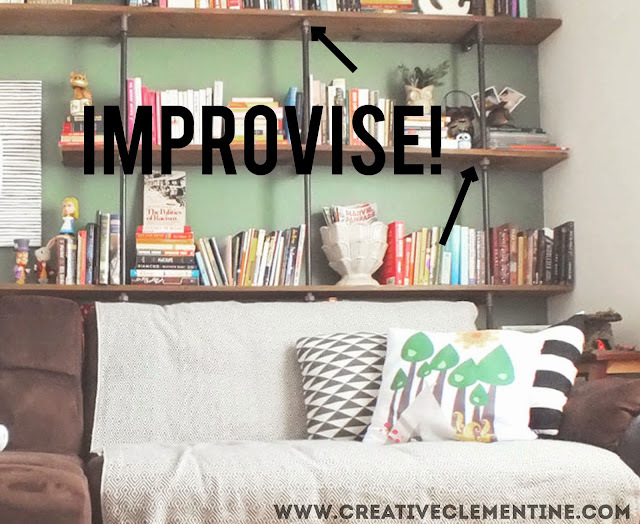 After sharing my Reading Room makeover, I thought I'd be a doll and share some lessons learned from the process of making DIY pipe shelves for the room. See that? I had to improvise. Now let'start from the beginning. I started my plan using the instructions from that post. In addition to her instructions, I made a few changes. First, I had to take the desired shelf depth into consideration because the room is small. From there, I checked the Home Depot website to see what was in stock at my store, and eventually, I had a plan! And after a lot of work, I even had shelves to show for it. BUT, I learned a few things along the way. 1. Draw out your plan. I followed DIY, esq's advice before embarking on this adventure. I had to rejig the plan to make the shelves less deep because of the room being so small. You can draw it out however your little heart (or your little room) desires. 2. Check out the availability online. Check for not only the quantity in stock, but also the lengths of pre-cut pipes. You may have included lengths that seem standard (in my case, 6") but straight up don't exist at your store. Adjust your plan accordingly. 5. Fake it til you make it. My store only had galvanized rods in stock for most of it, so I ended up spray painting them to match the black pipe. I used the black/bronze metallic spray paint and its barely noticeable. The authentic black pipes have a really cool rust thing happening, though. 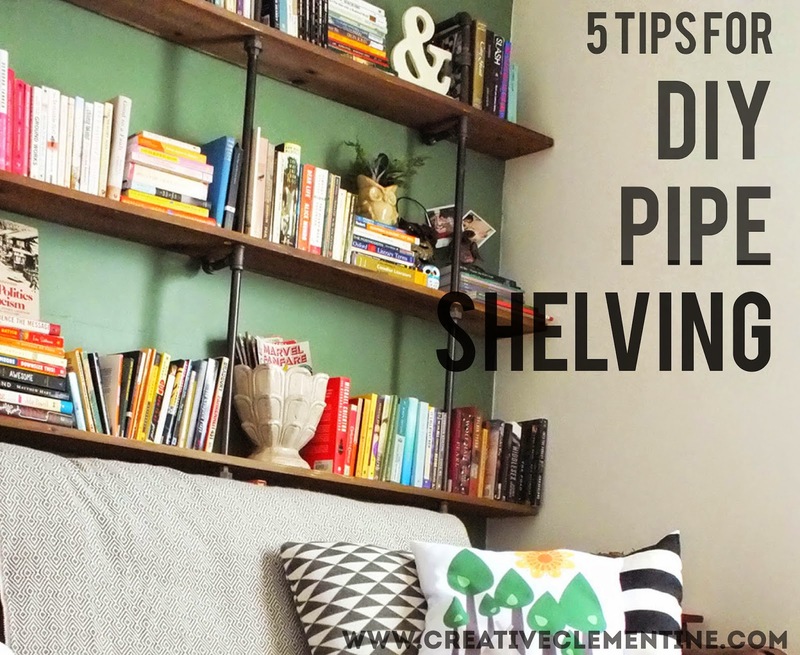 I hope these tips are useful for your DIY pipe shelf building adventures! Your shelves are SO cool! Were the galvanized pipes cheaper, too? For short lengths like that, I wondered about using pvc and spray painting, too. The galvanized pipes were about the same price, but only certain types of each pipe came in certain pre-cut sizes. I'm sure this whole setup could be done with PVC, but the wood might be a bit heavy for it. All in all, it was cheap enough that I didn't mind going for the plumbing pipes. I made some curtain rods from pipes like this. Wish I had looked online because the only thing available in stores for elbow joints were $30 a piece and really heavy so we ended up using some that weren't quite what I wanted. Thanks for sharing on Merry Monday! I really love this pipe shelving. It's a different flair than most shelves I see. Great job! Thanks! It was quite inexpensive, too. The best way to get a whole wall of shelving on the cheap, in my opinion. :) Thanks for stopping by! Thanks so much for sharing what you learned with us! I would love to make a shelf system like this for my son's room, and you just saved me a ton of headache! 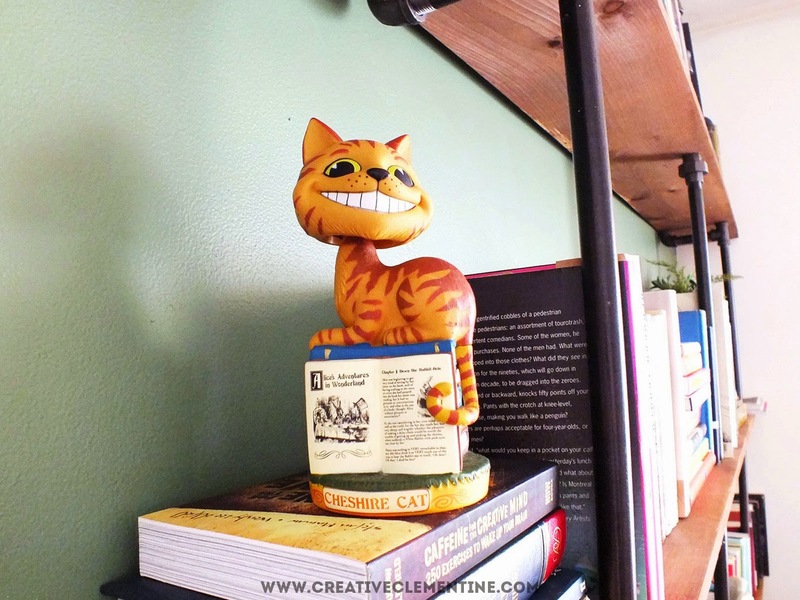 Thanks for linking up at Talented Tuesdays! This looks great! I've got a big empty wall behind my couch that is screaming for something like this. What a clever, clever idea! I am pinning and might use this idea in our downstairs area ... we have so many books we are always in need of more bookshelves. Visiting from Idea Box Thursday - and I absolutely love your header and the layout/design of your blog, by the way! So glad you stopped by!! This pipe shelf project has made me look at pipes in a whole new light. I try to use them for everything--- I even built a makeshift closet for my bedroom using it because it seemed easier than figuring out a closet kit.